It's 05:48 in Vyronas, Greece right now. 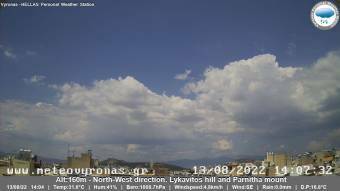 Skyview MeteoVyronas web camera viewing in northwestern direction. Vyronas: Sky above Vyronas, 0 miles away. Athens: Acropolis Panorama View, 1.7 miles away. Athens: Penteli Mountain, 1.7 miles away. Athens: The Acropolis of Athens - The Parthenon, 1.7 miles away. Athens: Hellenic Parliament, 1.7 miles away. Athens: Ermou Street and Syntagma Square, 1.7 miles away. Athens: The Acropolis, 1.7 miles away. Athens: Poseidon Athens Hotel, 1.7 miles away.